The DelfJet waterscooter is capable of 15 mph over the water and 7.5 mph underwater. The DelfJet is a combination of water scooter and jetski. Its design was inspired by the fast and elegant swimming style of dolphins. Offering extreme agility in water, the Delfjet proves that the ultimate hydrodynamic shapes still come from nature and changes completely the known restrictions of speed for human diving. A control grip is used to regulate the Delfjet's speed. With its power limited to 5 HP, the Delfjet is incredibly easy to drive and free from any license restrictions which usually apply on jetskis. Steering of the DelfJet is done by shifting the riders weight. If you should happen to drop the DelfJet a cut-off switch kicks in, stopping it immediately. 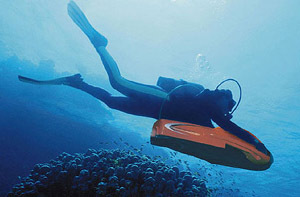 The diving depth of the DelfJet can be set on the control panel of the water scooter according to individual needs. 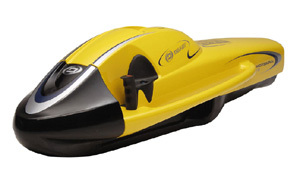 The standard diving depth has been pre-programmed to 2.5 meters for fun seekers and amateur divers. Higher spec models for scuba divers can dive to 50 meters. And the professional level Black Shadow version can dive to depths of up to 120 meters. A two-man rescue model is also available. Apply only light pressure and the Delfjet Waterscooter will obligingly begin to dive. The electric drive mechanism incorporated into the Delfjet was developed to produce the ideal amount of torque with great efficiency and the 5 horsepower waterjet engine is emission-free and almost totally silent. The electronic jet drive is also service and maintenance free and power comes from rechargeable high-energy Lithium-Ion cells that provide enough energy to run the Delfjet for an hour at full speed.